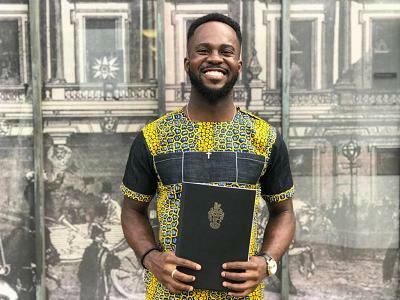 Southampton Business School masters student Terence Abeeku Dankyi has been chosen to take part in the Deloitte Experience Analytics conference in London to share his experiences and opinions with delegates and interview a leading leader within the industry. He will be sharing the stage with innovators from Dell Technologies, Vodafone, AstraZenaca and Deloitte; the agenda includes data responsibility, artificial intelligence and how companies can become insight-driven organisations. Terence won his place against competition from other talented students in a challenging selection process. At the Deloitte conference on 13 November, he will be discussing his views on the future of work and the priorities and worries of the incoming Gen Z workforce. The Risk Management student from Ghana chose to study at Southampton Business School to secure a qualification from a respected business school at a university that is ranked in the top one percent in the world: "Risk management is a broad topic covering subjects in the social sciences including finance, economics, public policy and ethics, all taught by expert lecturers with interesting talks from guest speakers," said Terence. "I enjoyed the challenge, learning alongside international students from different countries and have made many friends and potential business partners over the last year." Following the taught element of his course, Terence undertook two summer internships, one at the YMCA charity at Fairthorne Manor, Hampshire; the second at the Southampton Cultural Development Trust. "These opportunities have given me valuable experience and a deeper appreciation of the UK's workplace culture in two different sectors. It has been very rewarding." Now that he has completed his masters degree, Terence is embarking on a two-month internship in Chicago working for a start-up company which provides training in sales, marketing and business analytics. He secured his placement through aptitude tests and a series of Skype interviews with the CEO and Manager of Customer Success and Marketing. He will be returning briefly from Chicago to take part in the Experience Analytics conference. His current career ambitions are to work in consultancy combining data technology with human interactions and using the knowledge and skills he gained at Southampton Business School. Dr Mario Brito, Lecturer in Risk Analysis and Risk Management, adds: "We are very proud of Terence for his achievement. He has shown great business acumen throughout his degree and his hard work has resulted in this tremendous opportunity."